Laser engraving is a process by which you customize your walking stick by allowing us to engrave your walking stick or cane with your name, phone number, a quotation, scripture, or even a logo! You can create wonderful memories and gifts with names, dates, prose, quotes, or any other creative message. To select laser engraving, on the product page choose "Customize This Item" from the right hand menu. When you shop for your favorite walking stick or cane, choose Engraving Text, Font and Side in the Shopping Cart. The following prices apply to each personalized item. The minimum charge is $20 per item for any message for the first 20 characters. All engraving (with the exception of custom logos, etc.) runs horizontally, typically below the handle. 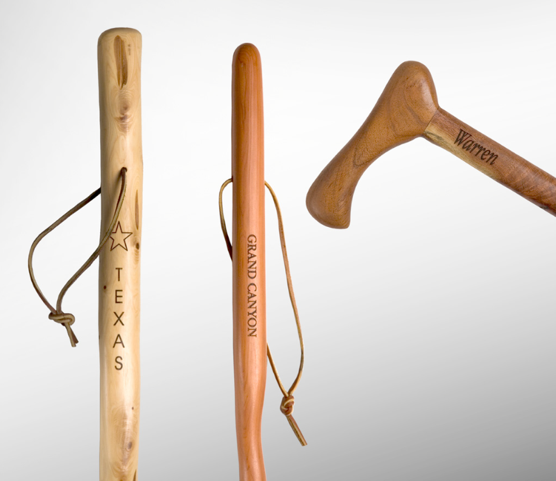 We reserve the right, based on our expertise, to place engraving in the most agreeable position on a walking stick or walking cane. Logo engraving starts at $30, but is heavily discounted for orders of 6 or more. Call or email info@brazossticks.com for details. Be creative when personalizing. We can do custom logos, Scripture verses, your name, phone number, just about anything! Interested in some inspiring creative ideas? Email your request to info@brazossticks.com. We can digitize your company logo or signature for engraving. We’ll set up your company, club, organization, association, etc. logo and place it on file FREE (a $50 value) with the purchase of $200 of merchandise and engraving. Once on file, logo/signature engraving depends on complexity. Email us the design and we will give you a custom quote. Depending on the the quantity of your order for your club, organization, association, department, etc. we will give you a completion and shipment schedule. If you wish, we can express digitize your logo/signature order for an up charge.